Editor's note: We continue with our series of reflections on Christmas in parts of the world where Florida Conference-supported missionaries are serving. Next week: Christmas in Japan. My wife and I were called by the Lord to serve as missionaries in the East Angola Conference of The United Methodist Church. At the Quéssua Methodist Mission, in the province of Malange, there is a group of children and teenagers living in an orphanage of the Annual Conference of Eastern Angola. Among the responsibilities we assumed as missionaries was providing care for these children and teenagers. Children in the care of the Quéssua mission in Angola enjoy the rhythms of Christmas. Photo from Leo and Cleivy Garcia. 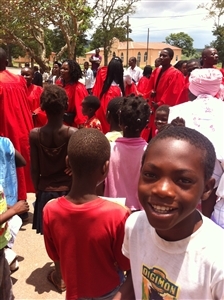 In 2012, we celebrated our first Christmas season in Angola. The great festival that all of Christianity celebrates around the world to commemorate Jesus’ birth was a big event for our community. In the midst of a different culture, away from our local church and separated from our biological family, celebrating Christmas seemed like a challenge. How to convey the meaning of Christmas to these children? We prepared the traditional dish of Angola to celebrate that day: chickpeas with cod, plus sweets, soft drinks and jams. The night of the 24th, as we awaited Christmas Day, 25 children and teenagers from the orphanage filled every corner of our small living room. Around 9 p.m., we started our party. All united in one mind, we sang Christmas carols in Portuguese. One of the orphans stood up, opened his Bible and read: "Arise, shine, for your light has come, and the glory of the Lord is risen upon you." (Isaiah 60:1) Then he encouraged all of us to make our lives shine through Christmas. Close to the end of the evening, “Silent Night” was sung in Portuguese and traditional languages. Hearts beat with joy, eyes were filled with tears of emotion and all raised their voices in shouts of joy and danced to the beat of the African drum. That’s how a missionary couple and “their” children celebrated Christmas in Angola, Africa, that year. "When they saw the star, they rejoiced with exceeding great joy. And going into the house they saw the child with Mary his mother, and fell down, and worshiped him: and opening their treasures, they offered him gifts of gold, frankincense and myrrh." From the Quéssua Mission, the heart of Methodism in East Angola, we sing with joy "Merry Christmas!” Adults and children receive the baby Jesus with joy in their homes. Such contentment described in the Holy Gospel according to St. Matthew is experienced by the faithful. The God who was born a baby chooses to have in place a manger: the hearts of the people who inhabit this humble African corner. Leo and I witness the joy with which the Angolan brothers enjoy this space all day December 25. This article presents the history of the most recent "Christmas in Africa." The Central Methodist Church in Quéssua became the meeting place for girls, boys, youth, adults and God. The same Lord who decided to live among humans came as a child to save us all. 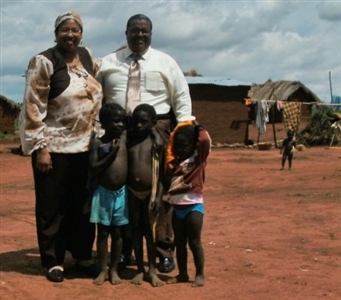 This realization continues to be a divine source of inspiration for the Angolan Methodists. And this year (2012), they decided to make the celebration of Christmas in the style of those ancient sages from the East who brought gifts to baby Jesus. 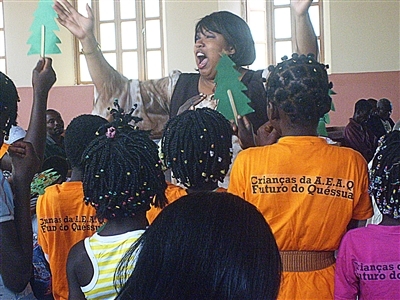 Dr. Cleivy Garcia leads children in Christmas song at the Quéssua mission in East Angola. Photo from Leo and Cleivy Garcia. Today, adults who were yesterday the kids of this land, committed to the Lord, have teamed up to provide spiritual and material gifts to those who needed them most. Men and women of faith were willing to offer hope to the poorest families of Quéssua. An unforgettable experience is well on the face of the eternal Lord and humanity. For 15 days before the celebration of Christmas, Sunday school teachers visit poor neighborhoods daily . They evangelize children and adults, teaching them hymns of the liturgical season. People perceive the story of the birth of Jesus through the preaching, singing and Bible stories being played. Many of them have received by faith the child born in Bethlehem for the first time. Others, with the message of Christmas, also receive gifts like toys, shoes, clothes and chocolates. The little ones and older children are living with intense joy from this singular experience, and they inspire us to praise the Lord. Jesus was born in Bethlehem also for Africa. Angola sings hymns that lift up Jesus, the light that illuminates the world . Quéssua loves the boy King, who radiates redemption and renews our hearts. Girls and boys in Angola express their joy by shouting, “Hallelujah , we are happy with God," while receiving the toys and other gifts. The desperate hands of their parents will never be empty because God has brought them hope. On this day, salvation, carols, smiles, hymns, praises and laughter accompany the mothers, fathers and children of this African land. Once again the story of the ancient village of Bethlehem, where Jesus was born, repeats itself. And so, like the first time this baby received gifts of gold, frankincense and myrrh, today children relive a similar experience in harmony with the revelation of the person of the Son of God and Savior of their lives. Jesus turned the most beautiful and valuable gifts that can be received by all and in all places. This year, I listen to expressions of great joy across Quéssua; it sure sounds like a very happy Christmas! *Leo and Cleivy Garcia were physicians in Cuba before receiving a call to ministry in 2005. They are missionaries appointed by the Methodist Church of Cuba and serving in the East Angola Conference, which receives support from Florida United Methodist churches through the East Angola/Florida Partnership, a Florida Conference initiative. Their service includes teaching at the Faculty of Theology in Quéssua, overseeing a boarding house for orphans and other young Angolans and facilitating visits from Florida mission teams. To read more about them and how you can support their ministry, click here. To access the Garcias' blog, click here.